kaupoo'. That may looked like abuse of position by us peasants. 2nd example, buying kate spade bags is one thing if you can afford it. left in this world to feed his family. come to you, but were told to 'get out of their elite faces'. The Prime Minister's Office issued on Friday a letter laying down the rules on how the People's Action Party's (PAP's) Members of Parliament should behave. 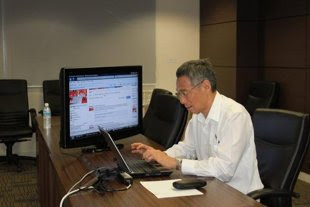 In the seven-page letter released to media, Prime Minister Lee Hsien Loong pointed out that the PAP's reputation for clean, incorruptible government was one of the party's most precious assets, and that every MP of the party "must uphold the rigorous standards that we have set for ourselves, and do nothing to compromise them". He also noted that the recently-concluded General Election has shown that voters have concerns which need to be addressed, and that the government will have to significantly improve outreach to the voters. He urged the MPs to "listen hard to voter concerns, help them to tackle pressing needs, reflect their worries and aspirations to the Government and persuade them to support policies which are in their own long term benefit." The Prime Minister also emphasised that the MPs must separate their public political positions from their private business or professional interests, including their responsibilities as directors of a board of private or publicly-listed companies. In general, he said that the MPs "must always uphold the high standards of the Party and not have lifestyles or personal conduct which will embarrass themselves and the Party." "Any slackening of standards, or show of arrogance or indifference by any MP will erode confidence in him, and ultimately in the Party and Government," he added. The PM's letter is re-posted in full below. What do you think of these dos and don'ts for PAP MPs? What do you think of PM Lee for issuing these rules? 1. Our Party has won 81 out of 87 seats in the just concluded General Election. The opposition contested 82 seats, of which the PAP won 76, with 60.1% of the votes. 2. The people have given us a clear mandate to carry out our programmes. We must fulfil what we have promised to do in our manifesto. We must never break faith with the people, but always carry out our duties to them responsibly, address their worries and advance their interests. 3. The elections have shown that voters have concerns which need to be addressed. The Government will have to significantly improve our outreach to voters, our approach to formulating policies, and our policies themselves. As MPs, you play key roles in all these areas. You have to listen hard to voter concerns, help them to tackle pressing needs, reflect their worries and aspirations to the Government and persuade them to support policies which are in their own long term benefit. 4. Singapore is in a new phase of its political development. The PAP government has to operate and govern in a different way than before. But two things should not change. First, we must always hold fast to the spirit of service to the people, and work hard on their behalf. Second, we must never compromise the high standards of honesty and integrity, which have enabled the PAP to keep trust with the people all these decades. 5. The PAP's reputation for clean, incorruptible government is one of our most precious assets. As PAP MPs, your standing in society reflects this high standing of the Party as a whole. I cannot stress strongly enough that every MP must uphold the rigorous standards that we have set for ourselves, and do nothing to compromise them. Never give cause for accusations that you are misusing your position, especially your access to Ministers. This would discredit both you and the Party. 6. As MPs, you will come across many different sorts of people. Some will be altruistic, public spirited people who will help you without wanting anything in return, spending their time and money to get community projects going and to serve your residents. But a few will cultivate you in order to obtain benefits for themselves or their companies, to gain respectability by association with you, or to get you to influence ministries and statutory boards to make decisions in their favour. Gift hampers on festive occasions, entertainment, and personal favours big and small are just a few of countless social lubricants which such people use to ingratiate themselves to MPs and make you obligated to them. 7. You must be able to distinguish between these two groups of people, and be shrewd in assessing the motives of those who seek to get close to you. At all times you must be seen to be beyond the influence of gifts or favours. 8. You should be scrupulously proper in your contacts with government departments or public officers. Do not lobby any ministry or statutory board on behalf of anyone who is not your constituent or grassroots activist. Do not raise matters with public officers on behalf of friends, clients, contractors, employers, or financiers to advance their business interests. To be above board, conduct business with public officers in writing and avoid making telephone requests. If you have to speak, follow up in writing to put your requests on record. 9. MPs are often approached by friends, grassroots leaders or proprietors of shops and businessmen to officiate at the openings of their new shops or other business events. They usually offer a gesture, such as a donation to a charity or constituency welfare fund. Though you may find it awkward to refuse such requests, once you accept one, you will be hard-pressed to draw a line. As a rule, you should decline invitations to such business events unless you have obtained prior approval from the Whip. The Whip will grant approval only if the business is one that will add much value to the economy. 10. You must separate your public political position from your private business or professional interests. MPs who are in business, who occupy senior management positions in companies, or who sit on company boards should be especially vigilant. You must not exploit your public position as Government MPs, your close contacts with the Ministers, or your access to government departments and civil servants, for your personal business interest or the benefit of your employers. Your conduct must always be above board. 11. MPs who are employed by companies or industry associations may at times have to make public statements on behalf of their company or industry association. If you have to do so, make it clear that you are not speaking as an MP, but in your private, professional or business capacity. 12. When you raise questions in Parliament related to your own businesses, you should first declare your pecuniary interest in the issue. Do not use Parliamentary questions as a means to lobby the Government on behalf of your businesses. 13. You may, however, speak freely to Cabinet Ministers, who are your Parliamentary colleagues. Ministers will listen carefully to arguments on principles, especially when they relate to the general policy of their Ministries. But Ministers will not change individual acts of discretion, unless they have very good reasons which they can justify publicly. Parliamentary Secretaries and Ministers of State who intervene in their Ministries to reverse or alter decisions should promptly report the matter to their Ministers to protect themselves against possible accusations of misconduct. The Government must always base decisions on the merits of the issues, and cannot yield to pressure from interested parties. 14. MPs are often invited to serve on the Boards of private and publicly listed companies. This is a sign that private sector values PAP MPs' integrity and service, and reflects the high standing of the Party and of PAP MPs in general. The Party permits MPs to serve as directors, provided you keep your private and public responsibilities rigorously separate. 15. The public will closely scrutinise your involvement in companies, because you are a PAP MP. You should conduct your business activities so as to bring credit to yourself and to the Party. Adverse publicity on your performance as a director, or lapses in the companies you are associated with, will tarnish your reputation as an MP and lower the public's regard for the Party. 16. You should not solicit for Directorships in any companies, lest you appear to be exploiting your political position to benefit yourself. 17. You should not accept directorships where the company just wants to dress up the board with a PAP MP or two, in order to look more respectable. 18. Some grassroots leaders are businessmen who own or manage companies. You should not sit on any boards of companies owned or chaired by grassroots leaders appointed by you, so as to avoid the perception that you are obligated to them or advancing their business interests. 19. If you are offered a Directorship, you have to decide for yourself whether to accept. The Party is not in a position to vet or approve such decisions. 20. Before accepting, consider the possible impact of the Directorship on your political life. Ensure that the company understands that you are doing so strictly in your private capacity, and will not use your public position to champion the interests of the company, or lobby the government on its behalf. a. How well do you know the company, its business strategy, financial status, shareholding structure and the underlying industry? b. Do you know your fellow directors, the way the Board and its committees fulfil their responsibilities, the reporting structure between Board and Management and the relationship between shareholders and the company? c. Do you have sufficient industry, financial or professional expertise to fulfil your expected role and responsibilities as a Director? Do you understand your obligations under the law and the Code of Corporate Governance? Will you be able to discharge your fiduciary duties properly and without fear or favour? d. Will you face any conflicts of interest, and if so can you manage them? If you are in any doubt, you should decline. 22. Once you have decided to accept an offer of a Directorship, please inform the Whip. Detailed reporting requirements can be found in the Annex. 23. MPs are expected to attend all sittings of Parliament. If you have to be absent from any sitting, seek the prior permission of the Government Whip. Please inform the Whip if you have to leave the Parliament premises while a sitting is on. 24. If you travel abroad, or need to be absent from Parliament for any reason, you must apply to the Speaker for leave, with copies to the Leader of the House and the Government Whip. You should also inform the Whip where you can be reached while away from Singapore. 25. I will ask the Speaker to give all MPs, particularly new MPs, ample opportunity and latitude to speak in Parliament. Your first opportunity will be during the debate following the President's Address at the opening of Parliament. At the Budget Debate, all MPs should speak up. Script your speeches or put your key points in note form to organise your ideas, and help the media. 26. The public expects PAP MPs to express their views frankly, whether for or against Government policies. In debates, speak freely and with conviction.Press your points vigorously, and do not shy away from robust debate. However, please exercise judgement when putting your points across. 27. Bring out grapevine talk for the Government to rebut, but do not unwittingly lend credence to baseless gossip. By doing so, you help ministers to put across the facts, explain the reasons for policies and decisions, and hence maintain public confidence in the openness and integrity of our actions. 28. Your honest, informed views are an important political input which Ministers will consider in formulating and calibrating policies. Ministers will accept valid, constructive suggestions, but they have to correct inaccurate or mistaken impressions. Over time, the public will see that PAP backbenchers are as effective as opposition MPs, if not better, at holding ministers to account, debating issues fully, and influencing policies for the better. 29. On certain occasions, like the National Day Parade and the Investiture Ceremony for National Day Awards, the whole Establishment, i.e. the Executive, the Legislature and the Judiciary, will be there. Those who cannot attend must have very good reasons. Those who have accepted the invitation must attend, otherwise they leave empty seats, which does no credit to them or to the Party. 30. At all public functions and constituency events, punctuality is of paramount importance. 31. You should not accept gifts which might place you under an obligation which conflicts with your public duties. If you receive any gifts other than from close personal friends or relatives, you must declare them to the Clerk of Parliament who will have the gifts valued. If you wish to keep the gifts, you must pay the Government for them at the valuation price. 32. Party Branches should not raise funds on their own without permission, for example by soliciting advertisements for a souvenir magazine or a carnival. If you intend to raise funds, please clear it beforehand with the Organising Secretary. When your branch embarks on a collective fund-raising activity, e.g. a Family Day or Walk-A-Jog, you must follow the rules strictly. 33. As MPs, you should manage your personal financial affairs prudently. Do not over-extend yourself, or become financially embarrassed. This would be not only a potential source of personal embarrassment, but also a weakness which may expose you to pressure or blackmail. 34. In particular, you should not make major financial commitments assuming that you will continue to receive your MP's allowance. While MPs typically serve several terms, you cannot assume that you will automatically be fielded in future General Elections, or that if fielded you will definitely be re-elected. There is no tenure or job security in politics. 35. For your own protection, every MP should disclose to me, in confidence, your business and professional interests, your present employment and monthly pay, all retainers and fees that you are receiving, and whether your job requires you to get in touch with officers of Government Ministries or statutory boards on behalf of employers or clients. Office holders need not do so because you will be subject to the reporting requirements of the Code of Conduct for ministers. This should be done by 30 June 2011. 36. We have held our position in successive elections because our integrity has never been in doubt, and because we are sensitive to the views and attitudes of the people we represent. MPs must always uphold the high standards of the Party and not have lifestyles or personal conduct which will embarrass themselves and the Party. Any slackening of standards, or show of arrogance or indifference by any MP will erode confidence in him, and ultimately in the Party and Government. New MPs can pick up the dos and don'ts from older MPs, so that they conduct themselves always with modesty, decorum and dignity. You must win respect, not popularity, to stay the course. 37. I am releasing a copy of this letter to the media so that the public knows the high standards we demand of our MPs. 2. There is no need to report Directorships of subsidiary companies that you hold by virtue of your employment in the main or holding company. 3. Please update the Whip whenever you have relinquished a Directorship or accepted a new appointment, within two weeks.